What is the best code of a given length? This natural, but very hard, question motivates the following definition. Definition: Let denote the largest such that there exists a [ ]-code in . Determining is one of the main problems in the theory of error-correcting codes. Let be a sequence of linear codes with parameters [ ] such that as , and such that both the limits and exist. The Singleton (upper) bound implies . Let denote the set of all such that there exists a sequence , , of [ ]-codes for which and . Theorem (Gilbert-Varshamov): We have . In other words, for each fixed , there exists an [ ]-code (which may depend on ) with . In particular, in the case , , where is the entropy function (for a q-ary channel). Not a single value of is known for ! Though my guess is that Goppa’s conjecture is true, it is known (thanks to work of Zink, Vladut and Varshamov) that the q-ary analog of Goppa’s conjecture is false for . On the other hand, we have the following theorem [J]. Theorem: If is true for infinitely many primes p with then Goppa’s conjecture is false. The rest of this post will be devoted to explaining the notation in this Theorem. The notation means: “For all subsets , holds.” The notation means: For each non-empty subset , define the hyperelliptic curve by , where . It may seem strange that a statement about the asymptotic bounds of error-correcting curves is related to the number of points on hyperelliptic curves, but for details see [J]. 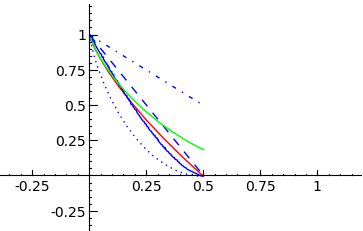 Unfortunately, it appears much more needs to be known about hyperelliptic curves over finite fields if one is to try to use this connection to prove or disprove Goppa’s conjecture. [J] D. Joyner, On quadratic residue codes and hyperelliptic curves. Discrete Mathematics & Theoretical Computer Science, Vol 10, No 1 (2008). [SS] S. Shokranian and M.A. Shokrollahi, Coding theory and bilinear complexity, Scientific Series of the International Bureau, KFA Julich Vol. 21, 1994. If you are interested in computing what c might be in the above statement B(c,p), the following SAGE code may help. First, the Python function below will return a random list of elements without repetition, if desired) from an object. Next, the SAGE code computes for a particular choice of the parameters. This gives a lower bound for c.
Based on experiments with this code, it appears that for “random” chices of S, and p “large”, the quotient is very close to 1.